Hulton Archive / Stringer / Getty Images and Kevin Hagen / Stringer / Getty ImagesJohn Adams hated being vice president. 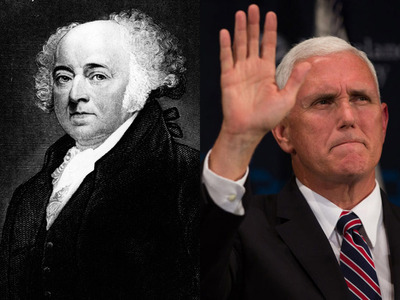 Mike Pence was just dubbed “the greatest vice president” since John Adams by Ohio congressman Steve Chabot. In reality, Adams hated his time as vice president. He was given very little to do other than preside over the Senate. The role of the vice president now holds significantly more power and prestige. Mike Pence is “the greatest vice president of the United States, well, since John Adams,” according to Rep. Steve Chabot of Ohio. Chabot probably meant that as a compliment. After all, he made the comparison while speaking at Pence’s event in Cincinnati on Wednesday, the Cincinnati Enquirer reported. Plus, Chabot is clearly a fan of the first-ever US vice president. He’s one of the co-sponsors of a bill that would set up an Adams Memorial Commission – a crucial step in establishing a national memorial dedicated to the founding father. Adams is certainly one of the preeminent founders of the United States. The prickly New Englander helped draft the Declaration of Independence, and was one of its biggest advocates in the Continental Congress. During the Revolutionary War, Adams went on to serve in a key diplomatic role in France, and ultimately participated in peace talks with Britain. As the second president of the United States, he participated in the fledgling country’s first-ever peaceful transfer of federal power. But if you look closely at Adams’ track record as the first US vice president, you’ll find that Chabot’s comment rings more as an unintentional insult. In Adams’s day, the vice presidency was still technically the second highest office in the US. But on a practical, day-to-day level, the role was more decorative than functional. Adams would chafe against the constraints of his office during his tenure under President George Washington from 1789 to 1797. The main task that fell to Adams was serving as president of the US Senate. But Adams, the consummate debater and lecturer, didn’t get much respect from the legislators. In theory, Adams could have had the ear of Washington, with whom he shared a good – but not especially close – relationship. But, according to PBS, Adams “was by no means a close adviser to President Washington” and ultimately had very little to do with shaping US policy. He didn’t even attend Cabinet meetings, according to Mount Vernon, Washington’s estate. At the end of the day, Adams was a backup president. A warm body who could slip into the role of chief executive if the unthinkable happened and Washington died in office. Meanwhile, there are a number of other more robust vice presidents that Chabot might have referenced in order to flatter Pence. According to “The American Vice Presidency: From Irrelevance to Power” author Jules Witcover, modern day vice presidents help to “shape and implement domestic and foreign policies in the administrations in which they have served” in a way that their earliest predecessors did not. Either way, while Adams may be a well-known founding father of the United States, that doesn’t mean that all of the phases of his career deserve equal commendation. And to equate the Pence vice presidency with the Adams vice presidency is to equate the sitting vice president with a stifled, widely derided figure. And surely, that wasn’t Chabot’s intent.